What Is An Middle-of-run Circuit? Unlike an end-of-run circuit which has only one cable in the junction box, a middle-of-run circuit has at least two cables in its junction box. One of the cables is used to feed power and the other is run to the device that needs the power. In this instance, let’s assume there is a light and a switch in the circuit. The first cable comes from the circuit breaker panel to the switch box. The second cable runs from the switch box to the light fixture. The black wire from the breaker connects to one side of the switch and the black wire from the light connects to the other switch terminal. The white neutral wires twist together in the switch box. The ground wires twist together, and two pigtail wires are also connected, one to the junction box and the other to receptacle itself. In review, the middle-of-run circuit is the middle device box within the circuit run, in this case the switch box. So how do you connect and wire outlet in a junction box? 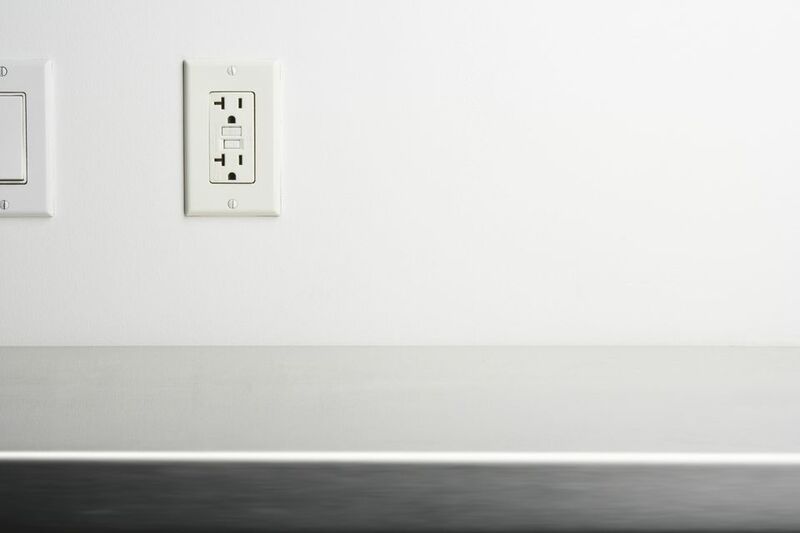 As with any electrical installation, the first step is to turn off the power to the circuit that you'll be working on before wiring and installing an outlet. Check first to see that the circuit is on with an electrical tester and then turn the circuit off. Double-check that the circuit is now dead and then you may begin the installation. There are a couple ways of stripping the outer sheathing of Romex wire. One is to use a razor knife. Carefully start the cut about six inches from the end of the wire. Make the cut in the center of the wire, but don't cut too deeply. Because the bare ground wire is located in this area of the wire, it's the safest place to make the cut without nicking the insulated wires. When wiring and installing an outlet, you can cut off excess sheathing by using side-cutting pliers (Dikes), carefully cut the excess outer sheath coating and filler paper from the wire. Try and make a clean cut all the way around the wire if possible. Be sure not to cut into the insulated wire coatings of the black and white wires. In order to make proper electrical connections to an outlet, you first must strip the appropriate amount of wire insulation from the wires. To do this, use wire strippers by selecting the proper sized wire size on the stripper gauge. If you're stripping NM 12-2 wire, then you'll use the #12 wire setting. Place the stripper over the wire at about 3/4" from the end of the wire. That will usually give you enough wire to make the connection. Depending on the type outlet you've selected to install and the brand name, the neutral connection may be different from the one I'm showing here. This neutral connection has slots that are tightened with the screws mounted on the side of the outlet. Notice that the white wire (neutral)is connected to the silver-colored terminal. Other outlets will have only the screws on the side to connect to. If so, connect the wires as you just connected the ground wire. That is, with the wire loop opening facing the right, connect it to the screw and tighten in a clockwise motion. Likewise, connect the green wire to the green ground terminal and you have successfully wired an outlet.